For four days, secret talks were conducted in a railway carriage in the forest surrounding Compiègne, France. 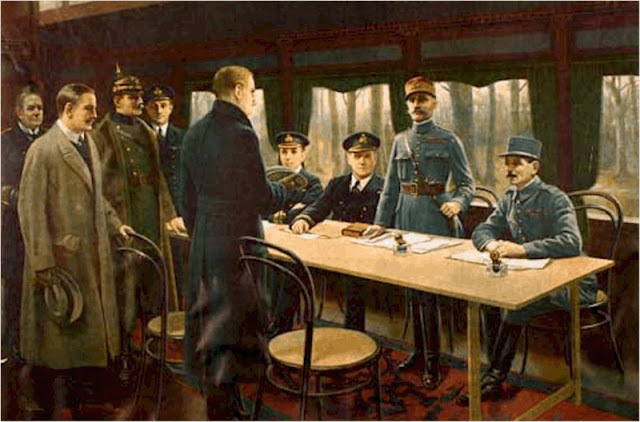 On 11 November, 1918, at 5:00 AM, an agreement was finally reached. The long-sought cease fire was to go into effect “at the 11th hour of the 11th day of the 11th month” of 1918 with the German signing of the Armistice. World War I was over! The anniversary of Armistice Day has been observed every year since then, beginning in 1919. The day is used to remember the soldiers who gave their lives to protect the freedoms of their countries. Over the years, the name of the observation had changed, depending on the country that was involved. For instance, on 11 November every year, the anniversary of Armistice Day, Great Britain observes a Moment of Silence at 11:00 AM, and on the second Sunday of November, they observe Remembrance Day. France observes Armistice Day on 11 November as a national holiday. In fact, it is one of the most important military celebrations in France. Of the 2 million casualties of World War I, a full 25% were French. The third member of the Triple Entente, the founding core of the Allies, was the Russian Empire. Because of the Russian Revolution starting in 1917, Russia does not observe Armistice Day. In terms of Russian history, it was only a side note, with the Russian Revolution taking centre stage. Australia – Remembrance Day (11 November), but ANZAC Day, 25 April, (Australia New Zealand Army Corps Day) is becoming the preferred national day of remembrance. Canada – Remembrance Day (11 November) is a public holiday in all provinces and territories except Ontario, Quebec, and Manitoba. In these provinces, Remembrance Day is not referred to as a holiday but rather a day of remembrance. New Zealand’s national day of remembrance is ANZAC Day (25 April) (Australia New Zealand Army Corps Day). Remembrance Day (11 November) was observed between the World Wars. Northern Ireland – Remembrance Day (11 November) and Remembrance Sunday (2nd Sunday in November) There have been ongoing political problems over the years. Republic of Ireland – Armistice or Remembrance Day (11 November) is not a public holiday. In July there is a National Day of Commemoration for Irish men and women who died in past wars. Netherlands – Remembrance Day is commemorated annually on 4 May. It is not a public holiday. Poland – Independence Day (11 November) is a public holiday. The end of World War I allowed Poland to regain freedom and unity of their country after over a hundred years of partitions. South Africa observes Poppy Day, but not as a public holiday. It takes place on the Saturday nearest to Remembrance Day (11 November), though in Cape Town a Remembrance Service is still held on 11 November each year. United States – Veterans Day (11 November) until 1954, it was observed as Armistice Day. The end of the Korean War brought the change. Now the day is to honour all service members, living or dead, whether they were in combat or not. Memorial Day (Last Monday in May) has always been the major remembrance for those killed in wars. If you know of any other countries that observe Armistice Day/Remembrance Day/Poppy Day/Veterans Day, let us know. Likewise, if you see any errors, let us know that, too.